Now that cooler weather is here, people get sick more often. You don’t have to be one of them. Here is a list of things you can do to strengthen your immune system to prevent yourself from getting sick. Reduce stress. Many people get sick when they’re stressed because their bodies are worn out. When we’re under excess stress, we tend not to look after ourselves. For a strong immune system, make sure that you keep stress levels under control. That includes getting adequate sleep, on average, 7 hours a night. For the sake of your health, it’s important to make time to take care of yourself, whether that be getting a weekly massage, going out with friends, or relaxing at home. Wash your hands. It’s very simple but it works. Wash your hands with soap and warm water several times a day to prevent acquiring and spreading germs. If there’s no sink nearby, keep hand sanitizer that has an alcohol base handy. Oral health is also important for a strong immune system. Make sure that you brush your teeth twice per day. Proper general hygiene reduces your exposure to germs and strengthens your immune system. Be sure to avoid antibacterial products because they make harmful bacteria more resistant to antibiotics and are harmful to the environment. Drink plenty of water. Eight glasses per day is a good volume to aim for, especially when you’re not feeling well. Staying well hydrated helps to prevent mucus buildup in the throat and lungs. If you’re drinking enough, your urine should be straw coloured (pale yellow). Eat a healthy diet. You can’t have a strong immune system if you eat unhealthy food loaded with sugar. So, eat lots of fruits and vegetables. Aim for 8 to 10 servings per day. Be sure to include garlic. Half a clove a day is all you need. 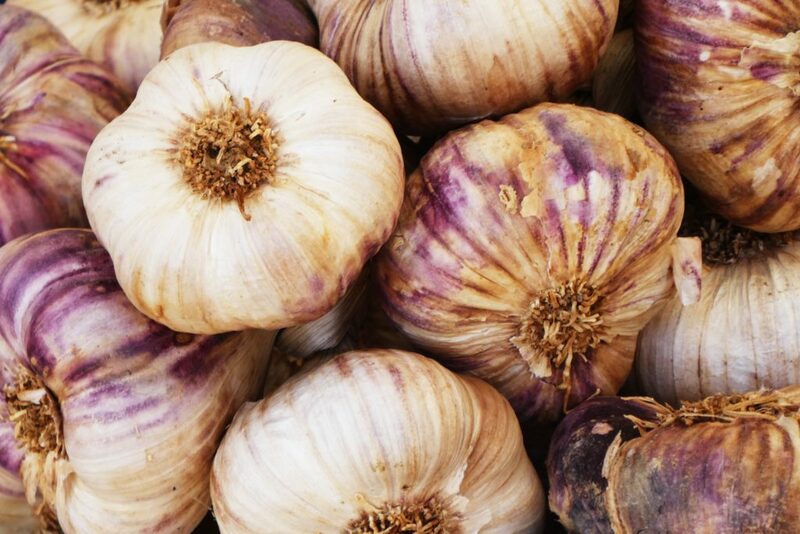 Garlic is a great immune enhancer. Its active ingredient is allicin, which is released when you mince or chop garlic and then let it sit for about 5 minutes. It is best eaten raw. Cooking makes it less potent. Instead of eating it straight up, you can add a crushed clove to cooked foods right before you eat to reap its benefits without feeling the strong taste. Limit your intake of refined sugar. Refined sugar causes your white blood cell count to be reduced by half for 24 h after you eat it. If you’re fighting off a cold, avoiding refined sugar will increase your chances of success. Sugar is often labelled differently on various products. If something is labelled sugar free but tastes sweet, it has a sweetener added by a different name, such as dextrose, maltodextrin, HFCS, and many others. Limit your exposure to toxins. If you smoke, smoking is your biggest source of toxins. Quitting is one of the best things you can do for your health. Limit your exposure to chemicals at home and in the workplace. Think about all the cleaning products and other chemicals, such as medications, you use on a regular basis. The more you use, the harder your body has to work to detoxify them and the harder it becomes to maintain a healthy immune system. Excess radiation exposure also weakens the immune system, so turn off you cell phone and your wifi when you’re not using them, especially at night. Drink alcohol in moderation. Alcohol has now been directly linked to head and neck cancers and indirectly to other cancers. Limit alcohol to one drink per day for women and two drinks per day for men. One drink equals 12 ounces of beer, 8-9 ounces of malt liquor, 5 ounces of wine, or 1.5 ounces of 80-proof liquor. Also, make sure to take breaks. For example, if you drink every day during the week, don’t drink any alcohol for at least one day on the weekend. Strengthen your lymphatic system through regular exercise, deep breathing, hot and cold contrast showers, or skin brushing. Your lymphatic system is the seat of your immune system. Keeping it healthy will help you avoid getting sick. Following these steps will reduce your chances of getting sick during cold weather. Look for my next blog post on what to do if you get sick. Previous Post What does it take to feel better? Next Post I’m sick. Now what?